EX-EAGLES CHIP KELLY AND EVAN MATHIS: GUESS WHO’S HAVING LAST LAUGH! 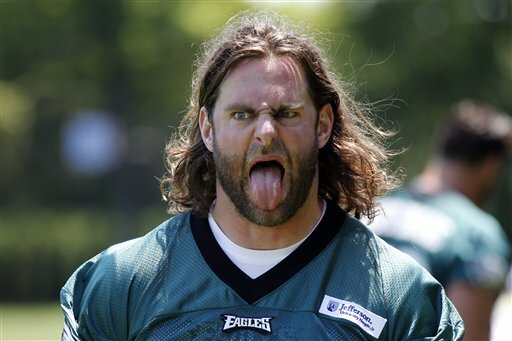 A year after ex-Eagles coach cut sold guard Evan Mathis.guess who’s having the last laugh. Mathis signed with the Denver Broncos last season, and now has a Super Bowl ring. This season, he is shooting for another with the Arizonan Cardinals. His contract: one year, $4 million with $2 million in incentives. This offseason, the two-time Pro Bowler had surgery on his ankle, departed the Super Bowl champions to join a different contender, and switched positions (from left guard to right guard) — and it still must have seemed boring compared to what he experienced last year. The Mathis saga was an ongoing story line last summer, as he was released by the Eagles in June when Philly wasn’t willing to give him a slight salary bump. Fans of any team with line issues clamored for his signing in 2015; Mathis ultimately joined the Broncos last August. His time in Denver culminated with a Super Bowl ring, but last season proved bumpy overall. Hamstring and ankle injuries bothered Mathis throughout the year, hampering his ability to settle into the offense. By the playoffs, though, he was playing more or less like his old self, and the Cards inked him to a one-year deal in March. They’re hoping that the adjustment will be smoother this time around, given that he had an entire offseason to recover from a procedure to remove bone spurs from his ankle and become familiar with his new linemates. Adding guard Mike Iupati (and handing the ball to dynamic rookie David Johnson) helped Arizona’s rushing offense jump from 30th in DVOA in 2014 to 16th in 2015, but right guard remained a trouble area for the Cardinals. Ted Larsen and Jonathan Cooper rotated at the position opposite Iupati last fall, and that football adage about quarterbacks — if you have two, you really have none — also rings true for positions along the offensive line. Mathis is a potential force in the running game, and his deal (worth up to $6 million with incentives) is a low-risk move for a team that is only concerned with winning a Super Bowl.